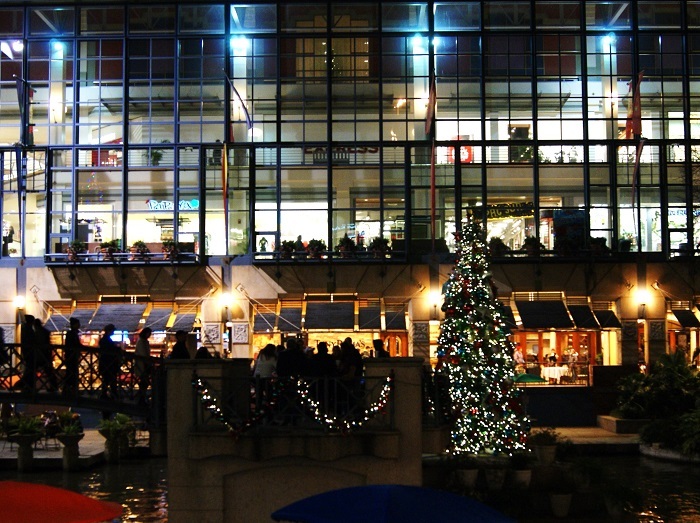 The holidays are a beautiful time to visit the San Antonio River Walk and River Center Mall. 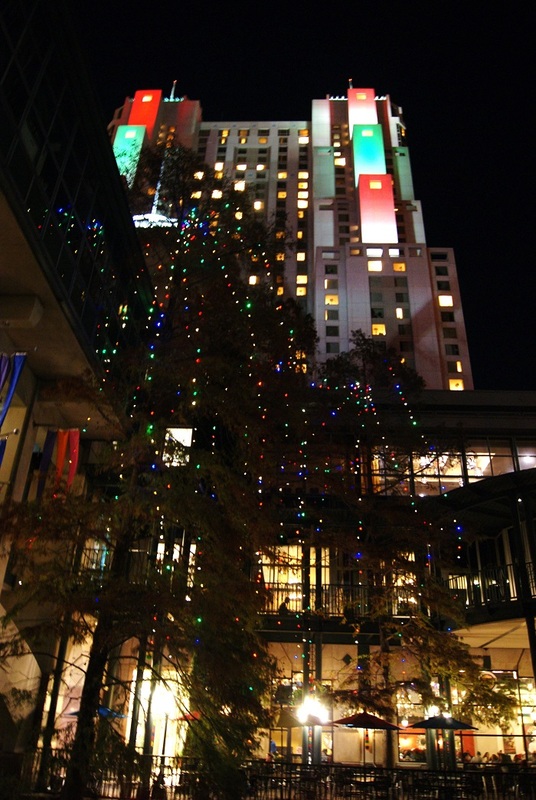 It's a great place to visit anytime of year but even more beautiful with the Christmas tree and all of the lights up. 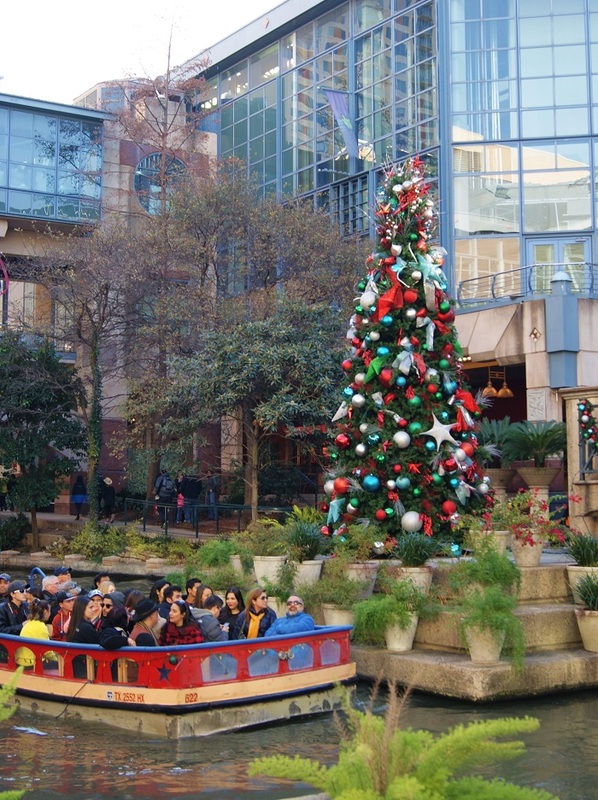 The surrounding buildings and downtown area are all beautifully decorated for the season, and the River Walk is adorned with Christmas decor and long strings of multi-colored lights. 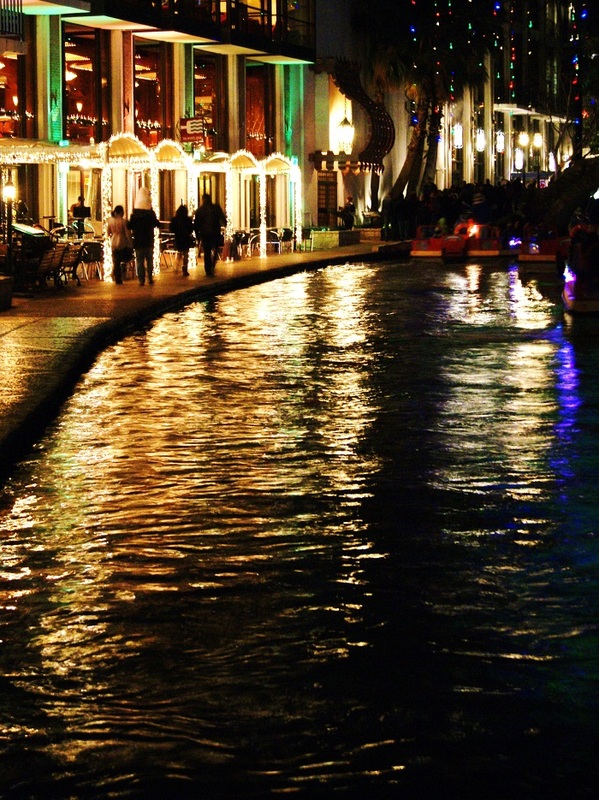 Granted colored lights aren't my favorite, but along the River Walk, it's beautiful. Outdoor seating (with a Starbucks just inside this level of the mall) overlooks the hub of the River Walk. It's a nice place to take a break and grab a coffee before you head out for a stroll. There are plenty of restaurants, cafes, and bars along the River Walk; many with outdoor seating. If you plan on eating during your stay, plan on trying one of the nice Italian or Mexican restaurants right off the water. But whether you stay for dinner or just enjoy the stroll, it's such a pretty and romantic place for a date. While I'd love to stay at a hotel downtown next time, I have to mention the resort we stayed at for the weekend. About an hour away from downtown San Antonio, there is an amazing resort called Canyon Lakeview Resort. If a relaxing cabin on the lake is more your speed, check it out before you book your stay in the area. We drove into San Antonio for a day but enjoyed the rest of the time at the cabin. A return to both places is definitely in our plans for the future. It is very crowded, ladies, use a purse that zips closed at the top just as a precaution. 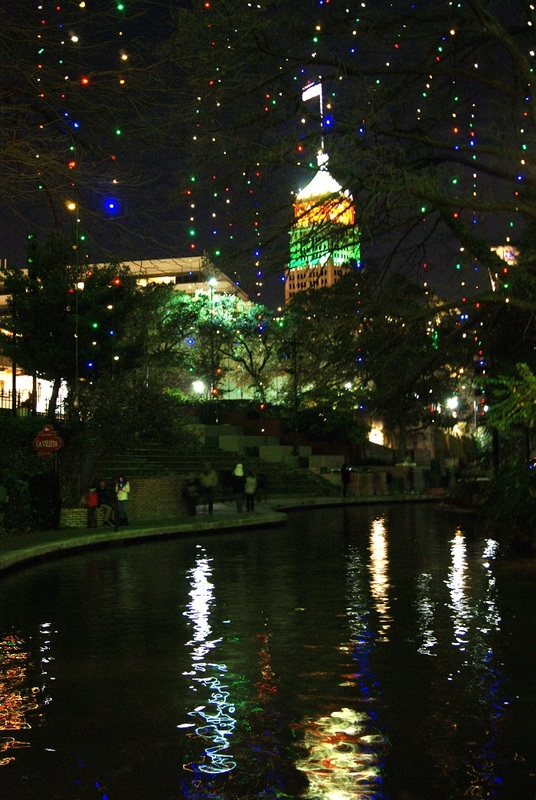 The weather is bearable during the holidays but can still be chilly if you do the River Walk at night. You'll want to bundle up. The Alamo is within walking distance. While everything is within walking distance, it is still a lot of walking and all on hard pavement. It's not the time for cute heels. Some cute flat boots are great though. Some of the bars will actually let you buy a drink and take it with you along the walk, so ask before you pick your bar of choice. 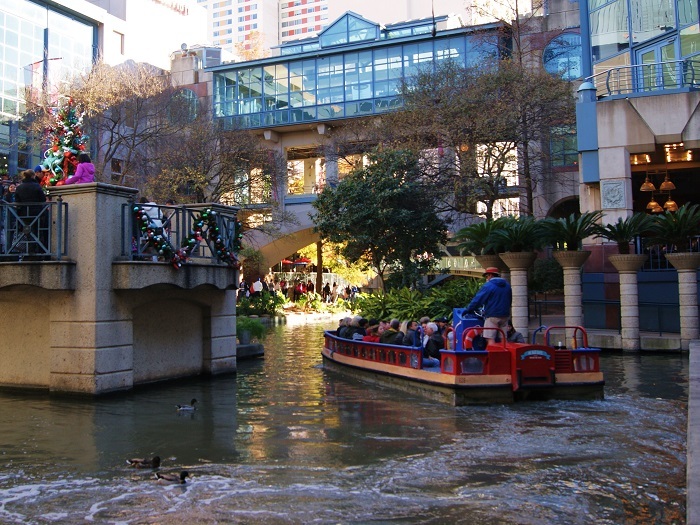 The restaurants on the River Walk can be pricey, so include that in your budget beforehand. 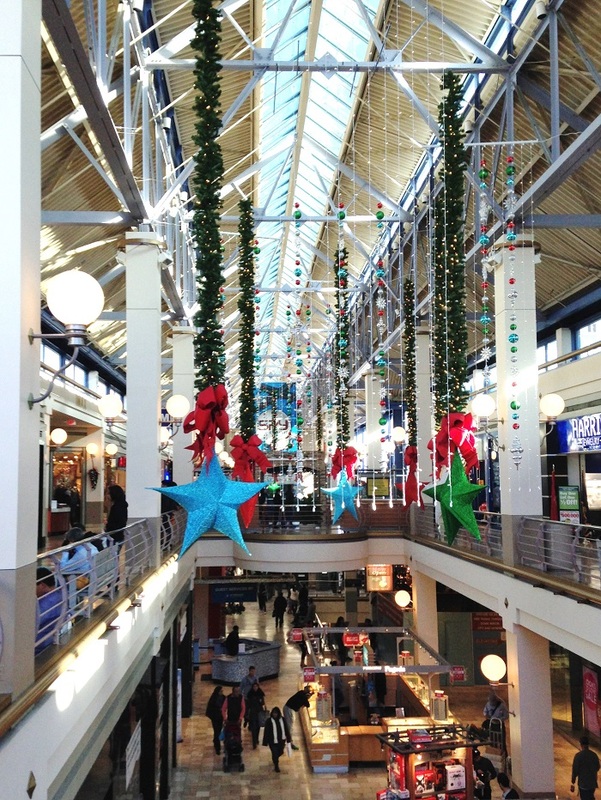 If you want to save on eating out during your stay, check out the food court inside the River Center Mall. The best place to park is the River Center Garage on Commerce Street, especially if you plan to go to the AMC inside the mall, which validates for up to three hours. Be sure to take your parking ticket in with you, as there are EZ Pay machines inside the mall. 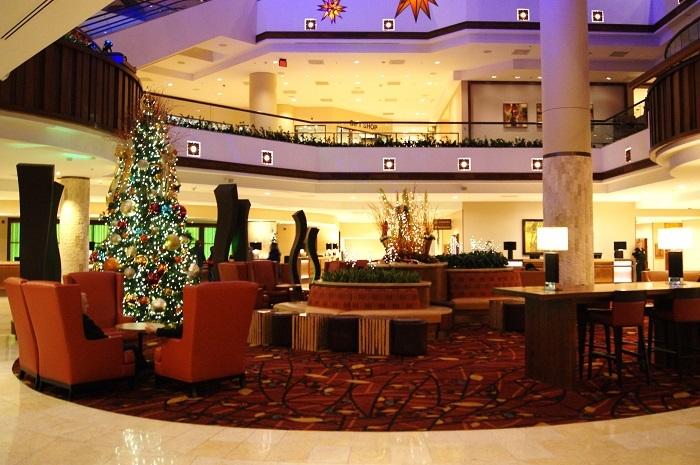 There is a nice Starbucks near the food court in the mall, but inside the Marriott that is connected to the mall there is a small Starbucks inside the gorgeous lobby (pictured above) - also a nice place to take a break. Note: That Starbucks isn't open at night. Found that out on this last visit. For souvenirs, don't bother with a shop along the River Walk. Go to Texas Treasures inside the mall, on the "fashion level." It's full of both San Antonio and Texas souvenirs, including locally-sourced high quality items. 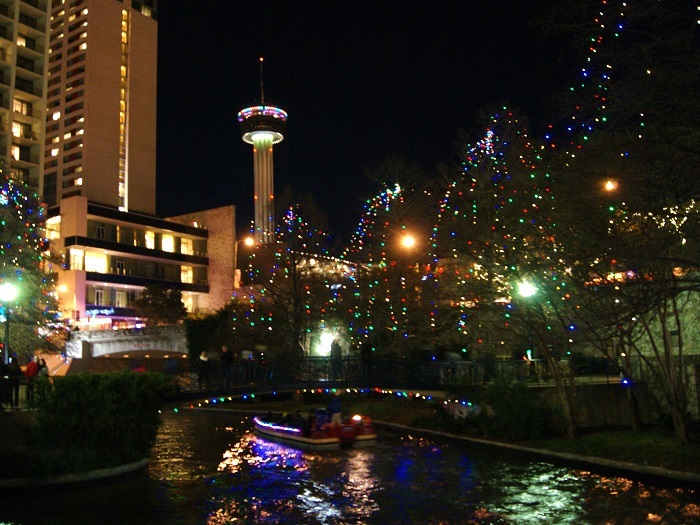 While the Marriott is directly connected to the mall, the Hyatt and Hilton are also located near the River walk. For a budget stay, there is a Holiday Inn Express near downtown that offers free breakfast and a free shuttle service to and from the River Center. It's crowded any time of year but more so during the holidays, and there are a lot of steps along the River Walk, so it's definitely not the easiest place to take a stroller. Though it is family-friendly, so while it's the perfect place for a romantic trip, it's also a good vacation spot if you have kids, but like I said, not the best place if you have a baby in a stroller. 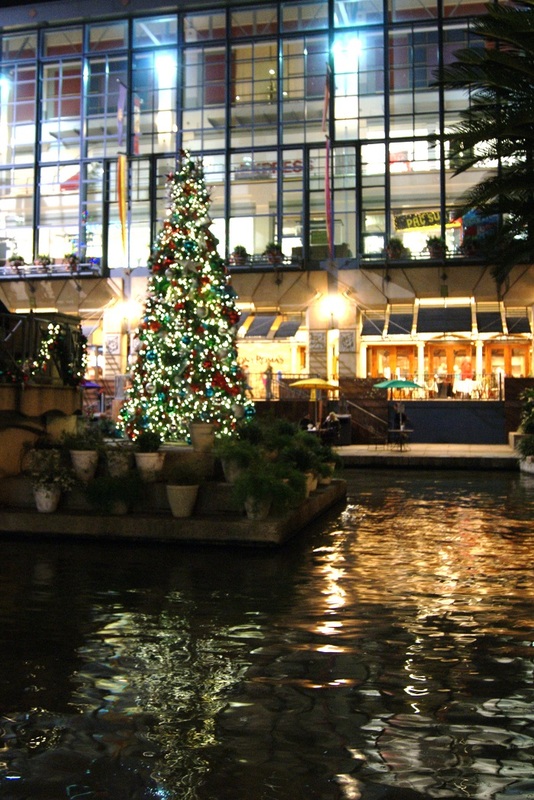 For more info, these are the official sites for the San Antonio River Walk and River Center Mall. This seems like a really great guide! I've never been to San Antonio (or anywhere in Texas) before! I grew up in Maine, and have spent a little time in California, but outside of that I haven't traveled much! I have a few close friends that travel a lot and have been to San Antonio and Phoenix several times and love both places! It seems like a great city. I'd love to experience it for a week or so, particularly this Riverwalk. The lights look so so beautiful, and the boat ride (is that a little boat those people are sitting in?) would be so much fun! My kiddos would have a blast with that. I, too, prefer white lights to colored, but there's a time and a place for colored and you're right, these decorations are beautiful. How was your Christmas? Happy New Year, by the way! I've heard many good things about the River Walk... I'd love to see San Antonio for myself someday.